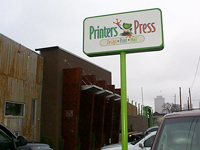 Printers Press Inc. : Company Information : Who Is Printers Press? Printers Press is YOUR local printer and has been for over 30 years! In 2010 we were honored with being voted one of the Top 3 Printers in Nashville by the Nashville Scene Reader's Poll and with each piece of paper through our presses we prove why. We invite you to call us at 615.297.5411 and find out what we can do for you today.